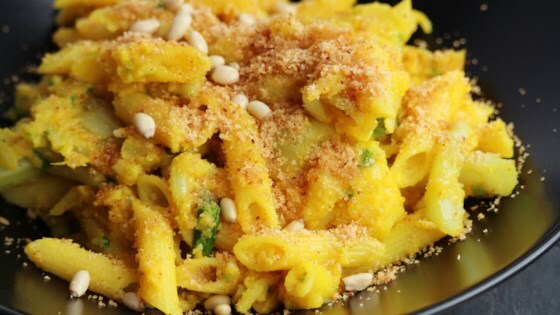 "Scandinavian flavors of saffron and golden raisins flavor this cauliflower and small pasta dish. Crispy, toasted bread crumbs lend a light crunch for contrast." Stir the saffron threads into the boiling water, and cover. Set aside to steep for several minutes while proceeding with the recipe. Toss the bread crumbs together with the melted butter, and lay out evenly on a cookie sheet. Bake in the preheated oven until golden and crispy, about 20 minutes. While the pasta is cooking, heat 2 teaspoons of vegetable oil in a skillet over medium heat. Stir in the onion, and cook until softened, about 3 minutes. Add the chopped cauliflower and saffron water; season to taste with salt and pepper. Increase heat to medium-high and simmer, uncovered, until the cauliflower has softened, about 10 minutes. Stir in the raisins, pine nuts, and cooked ziti. Pour into a serving dish and sprinkle with browned bread crumbs. I'll stick to a more traditional use of saffron next time.